University is a major change in many people lives, whether its moving away from home or making new friends etc. So we thought we would share with you our experience so far. I would say I was the least excited for the change from college to university out of all my friends (I would of happily stayed at college forever.. back then). I honestly didn't know if this was going to be for me. I was so anxious about starting university and not knowing anyone or what to expect. I honestly thought I'd be a loner for my whole university experience. So when it came to my friends leaving for university it was safe to say I was poo-ing my pants. Out of all my friends I was last to have my freshers which was helpful.. not. By the time freshers came, I had found the Law Freshers page for my university and luckily I met two girls on there, one of which is Em and the other a girl called Laura. I began talking to these girls on Facebook, about living arrangements, the course, freshers and other things I think. Anyhow from these chats we made arrangements to meet up to collect freshers bands and this was the beginning of our friendship. We went to as many freshers events as possible and during this time I began to get real close to Em as I would stay at hers and get ready with her before nights out. After having fun at freshers it sank in that university also has a serious side.. studying! This meant attending lectures, seminars, doing exams and going to the library. I honestly wouldn't change my university experience so far especially due to the friends i've made. It is definitely for me! I was extremely nervous about making the change from college to university. mainly because of the whole change which was needed from us, old friends moving away, the scary thought of having to make completely new friends. All that kept going through my mind was that it would be more difficult for me to make friends because I would be living at home rather than in student accommodation, which is why I decided to look up on facebook about the 'law fresher's page which basically was a page for all the law fresher's to meet and chat before university started: This is where I met Laura and Han. I was so relived to hear that they was living at home too which was the main thing we all had in common. After chatting for a bit we arranged to go to the fresher's events together. I was so unbelievable scared! Going on a night out with people I've never met before was a scary thing but it was actually really good everyone was so friendly. As we started going out more, me and Han become a lot closer we found that we have so much in common, and also she would stay at mine quite a lot when we went on nights out. We then also met Ange whilst attending lectures and seminars which then formed our little 'uni girls' group. It is true that you meet friends for life at university. 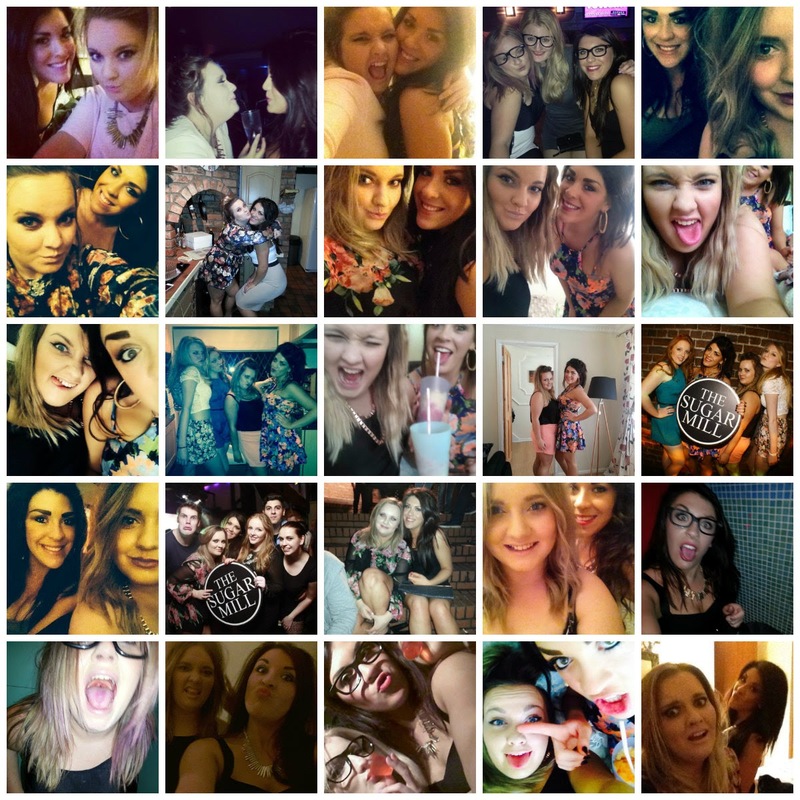 We are all such great friends, uni life wouldn't be the same without them. I would say that going to university is the best thing I have done, even though the work is so stressful I wouldn't change any of it. 1. How and when did you meet? Han: Well... facebook! Em: I put a status and han replied from that. Then we added each other as friends on facebook and the rest is history, haha! 2. What is your favourite memory together? Han: I've got so many...... but the time I fell over on a night out, and I basically forced you to help me up from the floor by saying we will no longer be best friends... i'm such a betch. Em: waking up after a night out and watching a hilarious drunken video with literally non stop laughing for at least an hour. 3. Describe each other in ONE word. 4. What's your favorite makeup brand? 5. What is something that annoys you about the other person? 6. Have you ever liked the same person? 7. If you could go anywhere in the world together, where would it be and why? 8. Who takes longer to get ready in the morning? Han: It depends if i'm getting ready properly then me if not its definitely you! Em: Han! 14. Comedy, Horror, or Chick-flick? 15. Blackberry or iPhone?Han: iphone Em: neither! 16. What is something weird that you eat? 18. Do you guys have anything matching? 19. What's your favorite TV show? Han & Em: pretty little liars!!!! This is a new blog about the lifestyle of two undergrad law students and their time in and out university. Hope you like our future posts about all sorts... ranging from fashion, beauty, social and personal life experiences.